“I believe it’s [been] a great conference. The theme and the message of this conference is the Church’s message, it’s Christ’s message in our world: how to be with those who are unprivileged, with those who are in trouble, with those who are suffering and those who are being oppressed. Those people live around us and we see them, so how will we react as a church and as a community? That’s why we hope and pray that the women who attended this conference, and all our churches, will always be a community of mercy… and care for those in need.” So spoke Archbishop Suheil Dawani as he reflected on the workshop. 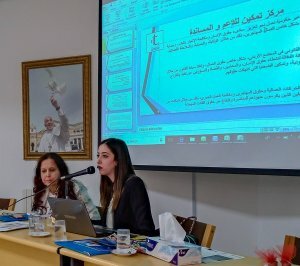 Over 40 women from the Diocese of Jerusalem travelled to Amman, Jordan over the weekend of 16-17 February 2019 to take part in a workshop on Safe Migration and Human Trafficking. 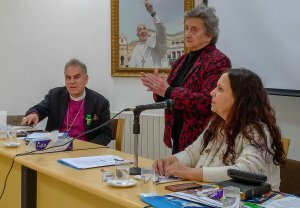 The gathering was convened jointly by the Women’s Ministry of the Diocese of Jerusalem and the Anglican Alliance, and graced by the presence of Archbishop Suheil Dawani, Primate of the Episcopal Church in Jerusalem & the Middle East. The purpose of the workshop was to raise awareness of an issue which, whilst prevalent, is not often discussed in the Middle East. The workshop was intended to be a space for learning both from the invited speakers and between the participants, as they shared their experiences, questions and concerns. The expectation was that participants would return to their communities empowered to be advocates for the issue, teaching others to spot the risks and signs of trafficking and modern day slavery. Revd. 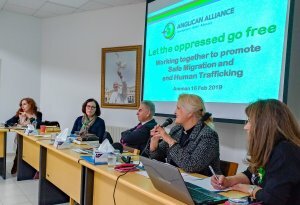 Rachel Carnegie, Executive Director of the Anglican Alliance, set the scene with an overview of human trafficking globally, discussing how people have always migrated, sometimes forced by conflict, climate change and poverty, sometimes simply seeking a better life. The key issue is to ensure that people migrate safely and do not get caught up in human trafficking, with its brutal exploitation. Seeking to escape poverty, people – and increasingly young people – respond to the lures of traffickers who then deceive and abuse them and sell them on into slavery. The scale of cruelty and suffering is unimaginable and calls for the churches to respond urgently. Human trafficking and modern slavery are a growing global crisis, with recent estimates of 30-45 million people oppressed in almost every part of the world. Trafficking is fast becoming the most lucrative form of organised crime, aided by modern communication systems. Combating global organised crime requires a global response through the kind of international, national and grassroots networks that the churches provide, working in collaboration with governments, private sector and civil society. 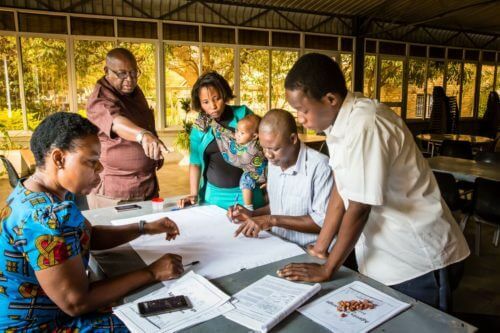 The importance of the issue – and the need for the Church to be able to respond effectively – has been raised in all the regional consultations of the Anglican Alliance and is one of the Alliance’s global priorities. The Global Slavery Index’s Arab States Report for 2018 highlights some of the areas of concern in the Levant, key amongst which is Migrant Domestic Workers (page 16 of the report). Lebanon and Jordan are the primary destinations for MDWs, with 250,000 in Lebanon and 53,000 in Jordan. In Lebanon, 90% of employers confiscate the legal documents of their MDW; 75% of MDWs are not given an independent day off; and an estimated 60% of employers do not pay or underpay their MDWs. The most visually apparent form of modern slavery in the Levant is forced work of child refugees from Syria and Iraq, in the form of begging or selling items at traffic lights, agricultural labour and other industries. In Lebanon in 2015, at least 1,500 children were reportedly begging and working as street vendors in and close to Beirut. Beggars on the streets, including women and children, who might be being controlled by someone else. Some even suffer amputations before being sent out to beg. A woman forced by her husband into prostitution. A young woman who met a man through the internet. He asked her to marry him but said that she should first have a range of medical tests. Ten days after they were married, her parents were sent her body, with her organs removed. People travelling to Asia for organ transplants, where the organs may be trafficked from prisoners and other vulnerable people. Domestic workers from other countries frequently being abused. They are made to work seven days a week and are sometimes isolated and not allowed out of the house. One of the participants, Du’aa Haddad, concluded the discussion saying that her heart was bleeding. She said that the victims were mostly women and children who had suffered for so many decades. She called for the international community to give support or the suffering will continue. Tamkeen is a Jordanian NGO working on legal representation and human rights for domestic workers and immigrants, including tackling human trafficking. Asma Amireh, a lawyer with Tamkeen, presented on their work. She described the range of cases Tamkeen has dealt with including forced labour in agriculture and factories, domestic servitude, prostitution, forced marriage and one case of organ trafficking. Tamkeen refers cases to the government Human Trafficking Unit in Jordan. Migrant workers are brought into the country and then, in some cases, verbal, financial and physical threats are used to control and exploit the person – who then becomes a victim of human trafficking. The key issue is for migrant workers to know their labour rights. For example, it is illegal to take someone’s passport in Jordan. It is very common for employers to retain the passports of migrant domestic workers as they are concerned about the warranty they have signed, but in fact, if the helper runs away, the employer just needs to inform the security service. Ms Amireh described the case of a woman who came to Jordan and worked for 23 years without pay. She had been inside the house for all these years. Another worker found her and together they found out about Tamkeen on the internet. Tamkeen called the government Human Trafficking Unit. The woman was rescued and is now staying with her embassy. She was owed 26,000 JOD. However, when the case reached court it was categorised as unpaid employment, not human trafficking, highlighting the need for the legal profession to know more about this issue. 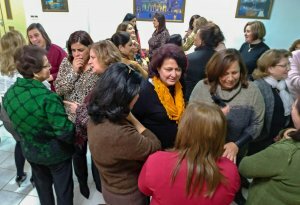 Sigi Sisterhood/Arabic Tadamun focuses on social work and women’s rights, including tackling gender-based violence. It is not specifically working on safe migration and human trafficking, but cases do arise through its social work. Inaam Asha talked about human trafficking as an international issue, with people made more vulnerable during times of conflict and forced migration. She stressed the value of working through the media to raise awareness of the issues and to give people information on where to get help. Ms Asha shared the case of a young conservative Muslim woman who applied on-line for a receptionist job in the Gulf. The ‘employers’ (actually traffickers) asked for photos, pushing her to send photos of herself unveiled and wearing make-up. They then tried to blackmail her into prostitution, threatening to expose the photos to her family and community. Fortunately, she contacted Tadamun, who supported her and reported to the authorities. The traffickers were found to be within the country and were caught. We must be more aware of the issues of human trafficking. We never realised they might be just around us. We are so touched by the cases we have heard. We need to open our eyes more on what is going on around us in society. I can help, even if just one person. There is so much potential for us as women to do good in our communities. We have influence and voice we can use. Together we can make a difference. This is putting the Sustainable Development Goals side by side with our church work. We have met women who are creating change – all together we can become more. We need to commit to creating community and collaborating more amongst ourselves and with others. It is a huge task but we can and will all be ‘change’ in our communities, homes and churches. We can be salt and light – engaging professions which can make a difference: teachers, doctors, health workers, business people, etc. We need more awareness, to learn more ourselves. Let’s plan for future workshops. We can spread awareness in schools, churches and communities. When we have the opportunity, we can speak out. We are called to be like Paul, speaking out for those enslaved in human trafficking.